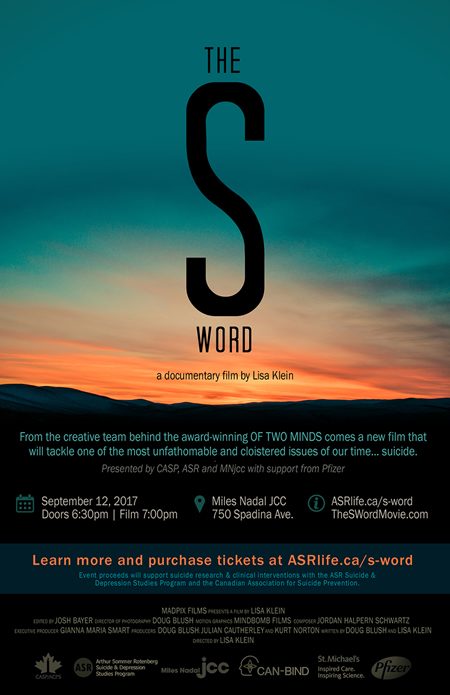 On the evening of September 12, an exclusive screening of the documentary THE S WORD, a new film by Lisa Klein was presented by CASP, ASR and MNjcc with support from Pfizer as part of the Canadian Association for Suicide Prevention (CASP) Conference on (September 11-12). THE S WORD is a groundbreaking documentary that shatters the silence around suicide and reveals a movement of survivors, artists and activists fighting to change how we deal with our ultimate taboo. This screening was presented as part of the CASP Conference programming, which has a focus on the role of the arts in suicide prevention, intervention and postvention. All proceeds from the event went to support the ASR Suicide & Depression Studies Program and the Canadian Association for Suicide Prevention. Learn more about the documentary on The S Word website, or view the trailer here.